I wasn’t planning on writing another post about this subject, but I got so many updates about the subject, I felt I should chime in. And I would’ve published this post earlier, but I had a family thing to attend, so that took up a bit of time. Well, no time like the present. Let’s talk Cockygate. Now, for those of you who don’t know, or don’t have time to read my last post on the subject, let me give a bit of background: Faleena Hopkins is a romance author who writes a series of books called the Cocky Brothers series (though apparently it’s gone by several names in the past). Recently she applied for a trademark for the word “cocky,” with somehow got approved by the Patent & Trademark Office. Technically speaking, this only allows her to have control of the word using a particular kind of font on her book covers, but she’s taken this to extreme levels, and has sent cease and desist letters to authors who use “cocky” in the titles of their books, telling them to either change the names of their books, take them off Amazon, or face legal action. The authors targeted are mainly self-published writers who can’t afford a legal battle, and changing a book’s title is hellishly hard (imagine the insanity that might come from trying to change the name of the Harry Potter books, for instance). This puts them in a really difficult position. 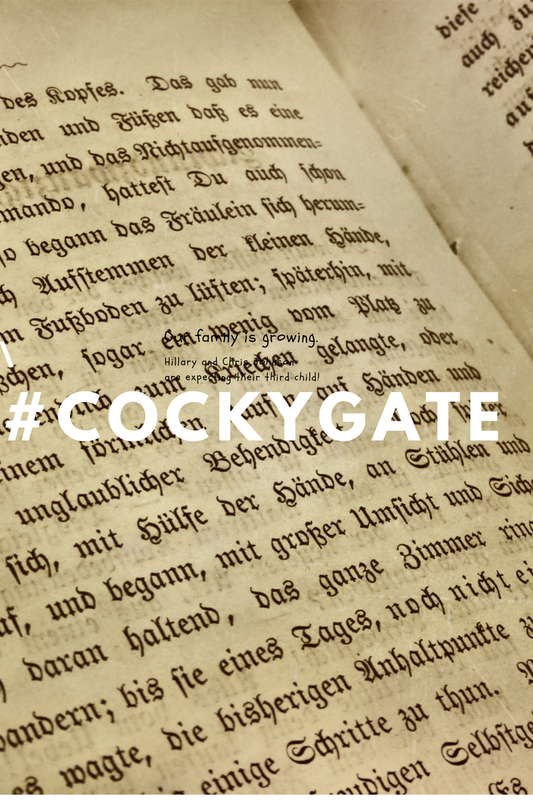 As you might expect, when word got out about this, things escalated quickly: authors quickly called out Hopkins on this move, calling it extortion and bullying; the hashtags #cockygate and #ByeFaleena (ha! that’s still funny) started trending on Twitter; the Romance Writers Association asked anyone affected by Hopkins to send proof to them and started consulting with an IP lawyer; and Hopkins, who apparently once said that anyone who uses stock photos after she uses them is copying her (that still boggles my mind), posted a video online trying to defend herself and instead dug herself deeper into a hole. Among other things. Yeah, this is one screwed up situation. And this has not only people angry at Hopkins, but afraid of the future: if you can trademark any word in a title, it’s possible no one will want to publish stories because they’re afraid they could get sued by a trademark owner for using a common word. A novelist and retired lawyer named Kevin Kneupper has come together with a bunch of other authors/lawyers to try to get the Patent & Trademark office to toss out Hopkins’ trademark using a petition for cancellation, which I applaud them for doing and hope they are successful. The creator of the font Hopkins uses for her books came out and stated that anyone who uses his fonts isn’t allowed to apply for trademarks using his font. So, Hopkins is telling people they’re infringing on her trademark while at the same time breaking the rules of usage for the font she uses. Someone needs to read the fine print before telling someone else to do so. Amazon has stated they won’t kick books off its website that have been targeted by Hopkins while they wait to see how this whole thing unfolds. A company called Rebellion Games tried to get a trademark on the word “Rebellion,” (just the word, as far as I can tell), and Mr. Kneupper apparently convinced them to reconsider (and suddenly I want to interview him for my blog and/or name a character in my next novel after him). Hopkins uploaded a video that’s since been taken down (but this is the Internet, so nothing ever goes away), where she said people were calling her and her fans stupid, and then said that meant they were calling her and her fans autistic. Um, say what? As far as I can find, no one brought up autism being mistaken for stupidity before you did. And as someone who’s on the spectrum, would you kindly leave my community out of this? IT HAS ABSOLUTELY NOTHING TO DO WITH WHAT YOU’VE BEEN DOING!!! In the same video, Hopkins also said someone had insinuated that she was part of the KKK (proof please? ), and said she would never be a Klansman, as she’s descended from a slave. Again, what does that have to do with you trying to trademark a word? And from what I’ve been hearing, some of the authors that have been targeted by the cease and desist letters are writers of color. And you’re not immune from criticism just because one of your ancestors was a slave. Heck, some of your critics may also be descendants of slaves. Hopkins’s books have apparently slid from the bestseller lists. Apparently there are consequences to doing something like this. Who knew? And most recently, Hopkins’ lawyer has sent Kneupper, along with fellow authors/lawyers Jennifer Watson and Tara Crescent, a letter stating that he’s going to be filing a lawsuit against them and seeking a Temporary Restraining Order against their Petition of Cancellation. Now, this last one happened on Friday apparently, so with a three-day weekend, I have no idea what might develop before Tuesday, if anything. The legal process for this sort of thing can be frustratingly slow. However, this latest development just goes to show just how far Hopkins will go to try to keep her trademark and the power she feels this has given her. She’s determined to make herself seem like an innovative businesswoman who’s being victimized by a mean gang of authors trying to protect her brand. Well, let her. She may have some supporters (some, but not many), but the longer this drags on and the more she tries to make herself seem like the victim, the more we’ll see her for the bully she is. And with the movement against what she’s doing growing and gaining allies every day, even if God forbid she does succeed in getting her copyright, she’ll just find herself isolated and hated. And in the end, that’s a victory no one wants. I would like to applaud everyone who’s come forward about Hopkins targeting them. Your bravery is a true testament to your resiliency and spirit. Remember, if you’ve been targeted, email carol.ritter@rwa.org and share your story. Together, we can protect your hard work from what’s happening. I’d also like to applaud all the other authors and readers out there who have said they won’t stand for this chicanery, and are fighting it every day, on and offline. And I’d like to give an especially big hand to Kevin Kneupper, Jennifer Watson, Tara Crescent, and the other writers/legal experts lending their talents to this case. Words cannot express what you’re doing to defend authors and fiction writing in general. Thank you for all you’ve been doing. When further updates come along, I’ll likely put out another post. Until then, keep your eyes peeled for more chicanery, and remember, we do have the power to fight back against this. We just have to be brave enough to use it. You did a great job of summing up everything that’s happened. It took a lot of courage for those authors to come forward with what Faleena did to them, and it’s so nice of people like Kevin Kneupper to file that petition to cancel it. I imagine things will get worse since it looks like Falenna insists on fighting this, but I just don’t see how the judge will let her keep the trademark on the word “cocky”. I can see “Cocker Brothers” being trademarked. I can even see a certain style font of a word as long as the font creator agreed to it. But the word “cocky” all by itself? I don’t see the judge upholding a trademark just on “cocky”. I don’t either, but the legal system is full of surprises. Whatever the case, it’s important to continue to spread the word and keep on fighting against horrible people like Hopkins. Otherwise, people like her will walk over anyone they can in order to fulfill their goals. I agree! I don’t want this kind of thing to keep happening. It’s awful enough as it is. We don’t need others to jump on the bandwagon and do the same thing. Which is why we’re all hoping Mr. Kneupper and his colleagues can stop this insanity in its tracks. The next couple of months should be interesting, I think. I didn’t see her facebook rant and haven’t heard this part before. Holy…*insert obscenities*. If I didn’t dislike her before, this alone would be enough to do it! I just don’t have any words. I’ve heard that there are trademarks filed on several other words now…Shifter World, Forever, and I forget the other one. I’ve decided that if it comes to it where I get slapped for it I’ll just take my books down and move to Patreon. I’ve contemplated that, anyway, LOL! It might be a good move, should things go sideways. I hope it doesn’t, but best to be prepared. Yeah, I’m researching it because I initially thought about just doing it on the side, but hey, good to have a back up! 1,000 Followers!!! Thank You So Much!! !